Education is power. That’s the premise of the Blue Collar Investor. 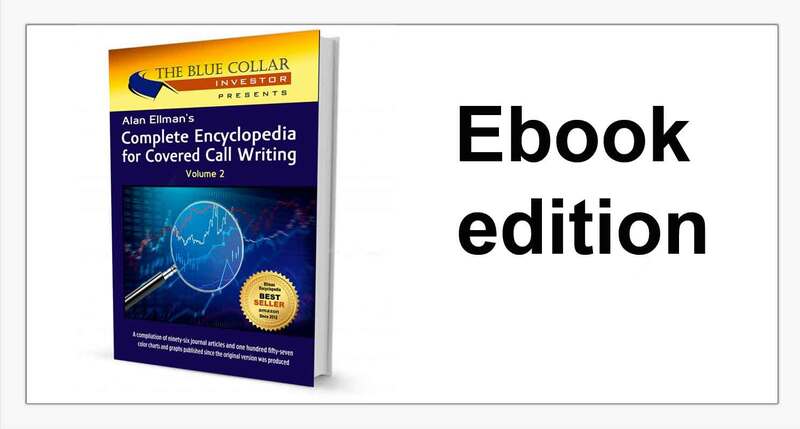 When the Complete Encyclopedia for Covered Call Writing was published at the end of 2011 and immediately became the best-selling book on this great strategy I realized that eventually there would be a Volume 2. It took me four years to gather the information for the original version and I projected four years down the road and realized that more information would become available, more examples could be provided to clarify certain issues and BCI members would make me aware of tangential topics of interest. I also write weekly newsletter articles for the BCI site as well as for other US and international financial venues. It didn’t take a stroke of genius to craft a plan that would allow me to provide new and enhanced information and keep it within the framework of the Complete Encyclopedia for Covered Call Writing, a format you have embraced more than I could ever have imagined. Here was my plan of action: Each time I wrote an article on a particular topic, I placed that material in the appropriate corresponding chapter of the original publication. So, if an article was related to technical analysis, it was placed in Chapter 4- Technical Analysis. If it was related to calculations, it was entered into Chapter 6- Calculations and so on. The result has been ninety-six articles with one hundred fifty-seven color charts and graphs. As I type this introduction, I already have several more articles published that will be placed into Volume 3, a publication for some future date. This book should be treated as an adjunct to the original. After reading and mastering each chapter in the original Complete Encyclopedia (guess it wasn’t “complete” after all!) the reader can then read the corresponding chapter in Volume 2. Why not know more than everybody else? Why should the learning process ever end? This has been, and continues to be, an enlightening situation for me as well. When you suggest a topic to me, it’s time to go to work and research the subject. Sure I know much of what is asked, but not everything. So I am focused in on learning just as you are. I hope you enjoy and benefit from this book. Without your feedback, many of the topics covered would not be included in this publication so you have as much to do about this book as I have (but don’t consider yourself my partner…not happening!). Wishing you a profitable and enjoyable financial future.